'Captain Marvel' Has Landed! Check Out the Premiere Trailer! I have to assume it's the implications for the yet to be titled Avengers 4, but for whatever reason the buzz surrounding Marvel's newest, and apparently most powerful, hero is as electric as the energy surrounding Thor when he shows up in Wakanda. To say this trailer was hotly anticipated is a monsterous understatement, well it's here and damn does it deliver. 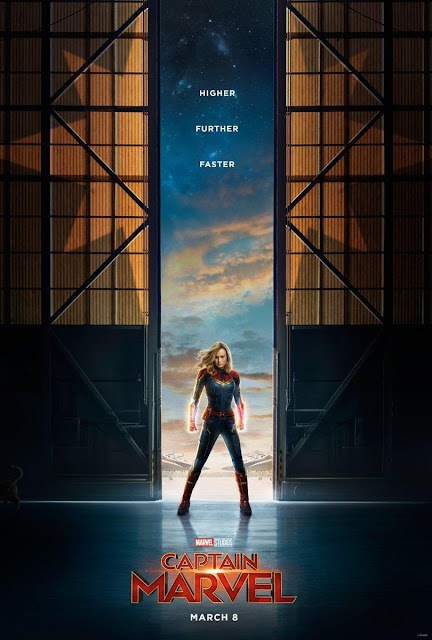 Setting up the time period right from jump street by having our hero crash land into a fully functional Blockbuster Video, the 90's set Captain Marvel is astounding in every way. The most apparent, and technical reason is the deaging that has been done on SLJ's Nick Fury and his #1 Phil Coulson. It's one thing to see the results in a still picture but to see the flawless nature of the effect in full motion is a whole new ballgame, it's something that appears so simple but is really game changing. The trailer itself doesn't reveal a ton about the plot or Kree threat that has been teased. We see Carol Danvers struggle with memory loss keeping her human side and life as something between a broken memory and a dream. What we are given is a sumptuous taste of the vastness of the universe that Danvers brings to the MCU, just when you thought the universe couldn't get any more diverse after Thor and Guardians of the Galaxy we are being opened up to a whole new section of sci-fi goodness. Enough jabbering from me, check out the trailer below and let me know what you think!